We LOVE Mexican food in my house, tacos, taco chili, enchiladas, you name it! This Mexican inspired side dish is perfect for those nights. It’s super quick and much healthier than using a boxed pre-seasoned rice (also MUCH lower in sodium and made with real fresh veggies as opposed to dehydrated ones). 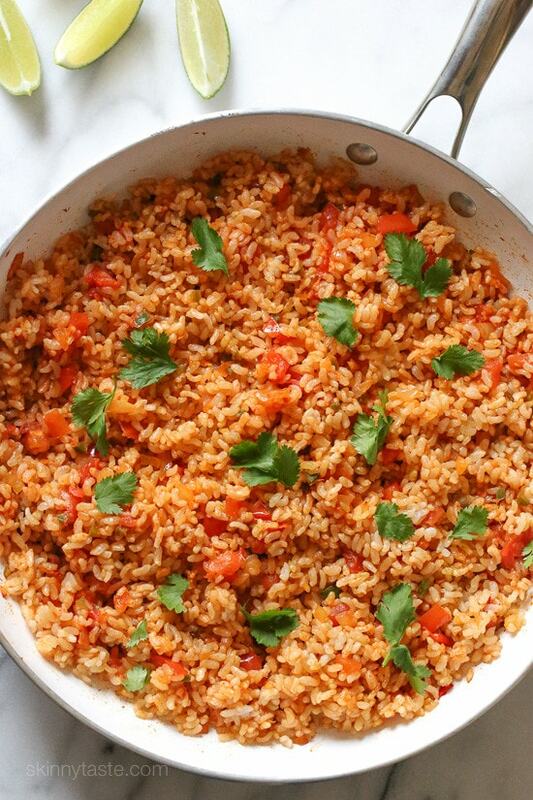 You can make this with leftover brown rice, but if you’re live near a Trader Joe’s, I’m pretty obsessed with their frozen brown rice – it’s the perfect texture and takes just 3 minutes to heat up. Great for those days I don’t have time to make brown rice from scratch. Heat the oil in a large skillet over medium-high heat. 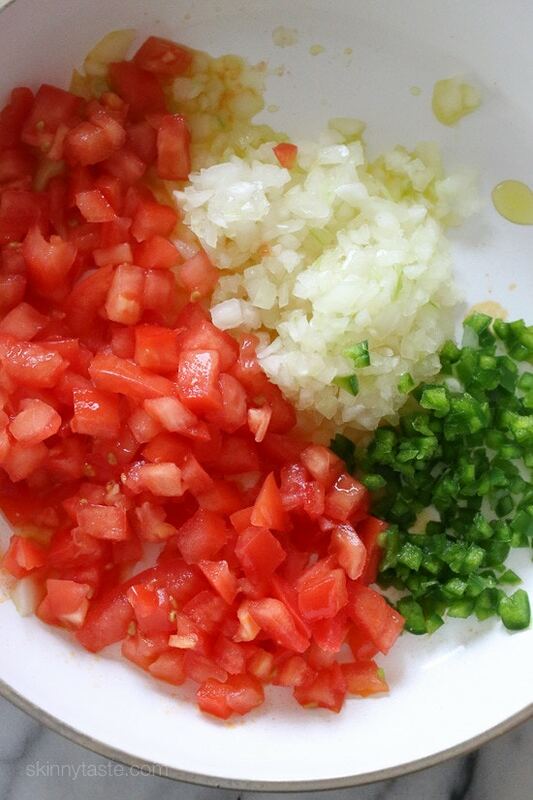 When hot, add the onions, tomatoes and jalapeno and sauté until just tender, about 2-3 minutes. Add garlic and sauté for another minute. Add the tomato paste, cumin, paprika, cayenne, salt and pepper. Stir to evenly coat the vegetables. Add the cooked rice, stir, and cook for 1 minute or until heated through. Serve with cilantro and lime wedges on the side. 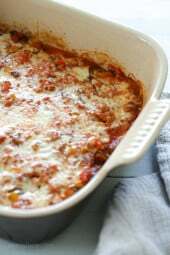 Can I use canned tomatoes instead if plum tomatoes aren’t in season? How much would I use? This is delicious. I just started using this site as a resource in my weight loss journey and I love it and the books. I cooked this with the slow cooker taquitos and everyone loved it. Just made it. It is very tasty, fresh, and flavorful. Thanks so much for this excellent recipe. I already had TJs frozen brown rice in the freezer, and agree that it is the best frozen brown rice. Thanks again! So very good! The lime really brightens it even more. This is becoming one of my lunch staples. Thank you Gina. This Fresh Mex rice was a delicious side dish with my take on vegetarian crab cake tacos – thanks for providing such a great replacement for the ‘San Francisco Treat’ (if you’re old enough to remember those commercials lol). This recipe is amazing!!! So delicious, and so easy to make. Thank you so much!! 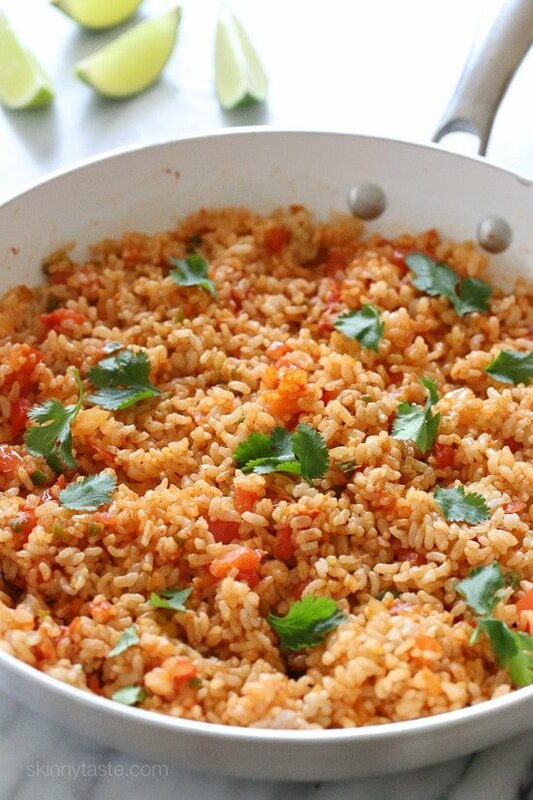 How many bags of the Trader Joes cooked brown rice do you need for this recipe? Thanks! Very yummy, added some salsa Lizano (Costa rican sauce) and and bell pepper instead of tomato as I didn’t have tomatoes and it was fabulous and satisfying! Thx! Super easy and delish. Will be a new staple. Made this last night and it was super good! I added a few dashes of Sriracha dry seasoning on top to give it a little heat. Yum! Could I freeze this afterward? You say quick, but that list of ingredients does not look quick to me. Maybe this recipe is routine for some people, but I cannot imagine it for me. How would you suggest adding chicken to this dish? So delicious! Added black beans and veggies like someone suggested and it was a perfect vegetarian meal. Thank you! Just made this and it was delicious! !….as always! Ps I made it with frozen cooked brown rice the first time and again with frozen cooked quinoa and it was AMAZING both ways! 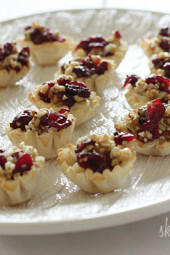 One of my favorite recipes from your site. Very flavorful! Loved this! Made it for the week and making my own chipotle burrito bowls for lunch!! I love your recipes. If I have one complaint it is printing them, can you please have the recipes print on one page only. Printing out a 2 page recipe is difficult to work with. Then I have to copy, paste and resize for it all to fit on one page to fit in my book. Are you using the print button within the recipe? I was wondering if you could use cauliflower “rice” too. Would this work with riced cauliflower? I’ve got everything in house to make this except plum tomatoes. What do you think about using canned diced tomatoes (drained well)? Too saucy perhaps? This was really delicious. I made it with white rice, since my husband won’t eat brown, and it was still good. I think I might make some with brown rice and freeze it so I can just have one portion when I want. Thanks for a great recipe! I made this to serve with the Cheesy Jalapeño Popper Stuffed Chicken – amazing together! Can you use turbinado sugar for the brown sugar? I made this for dinner along with your chicken enchiladas. This rice was really good! I added corn and black beans for a bit extra, but it was great as is too! Thanks for another fantastic recipe! I just made this for dinner and it was really easy and really good! Added some veggies and black beans and dinner was done. Thank you! I thought about making a big batch and freezing some of it. Have you tried freezing and reheating this? Looks perfect for stuffing inside an enchilada! This is DELICIOUS. just finished it and it's sitting on the stove while I wait for the Boy to get home. Not sure it's gonna make it, it's too good!!!! Thank you Gina! I have tried several recipes and have not had any luck with brown rice and flavor. 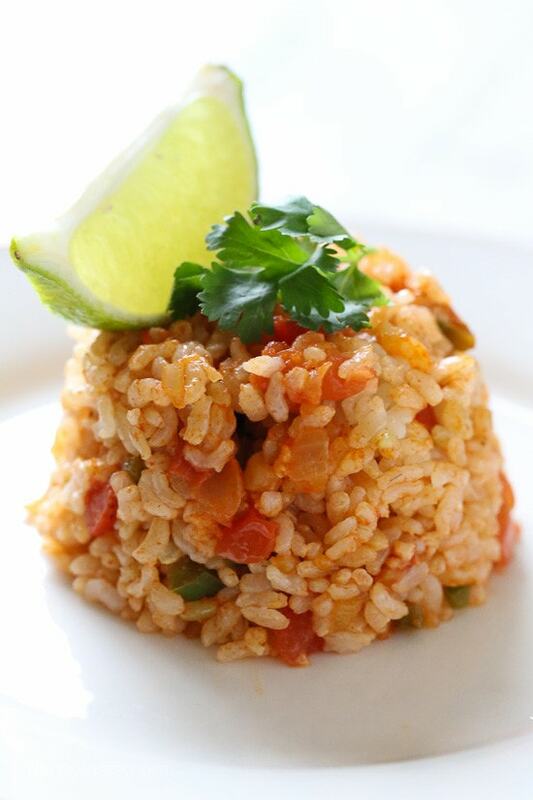 Your recipes are always amazing, so I am sure I have finally found the best recipe for brown rice Mexican rice. Any chance you could fly to Madrid and make me this? Haha! looks delicious! 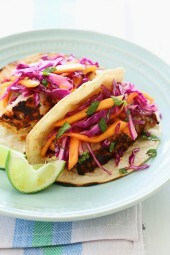 Can't wait to try this on the weekend – we were craving some Mexican last night! We made this last night! Amazing! It was plenty spicy for us without the jalapeño, too! 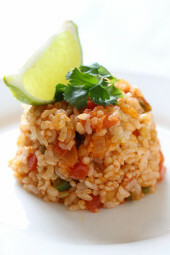 Love having an easy go to Mexican rice recipe that's fresh and not out of a box! Thanks so much!! you are so my hero!!!!! we have learned so much from you about flavor and being able to cook healthy!!! I always cook extra brown rice and freeze myself but love Trader Joe's if i run out. This rice looks awesome!! Its alot easier then people realize to cook healthy and leave those boxes out of your house!! Yes, I started freezing my brown rice too! TJs Frozen Brown Rice is also a great love of mine! I can't wait to try your recipe-YUMMMM! Delicious! I had leftover brown rice so I made this for lunch. Love your recipes! Do you think that quinoa might work? I don't know how much it'd change the point values though. I have a recipe for mexican rice that starts with uncooked rice. It's delicious, but this is great when I don't have the extra time to wait for that one to cook and a great way to use rice leftovers!! I'll have to try this. We've eaten your Arroz Congri twice in the past week. I'll have to switch to white rice. My kids and husband won't do brown. The whole family loves rice. Which is funny since we are German. I love your recipies, Gina. 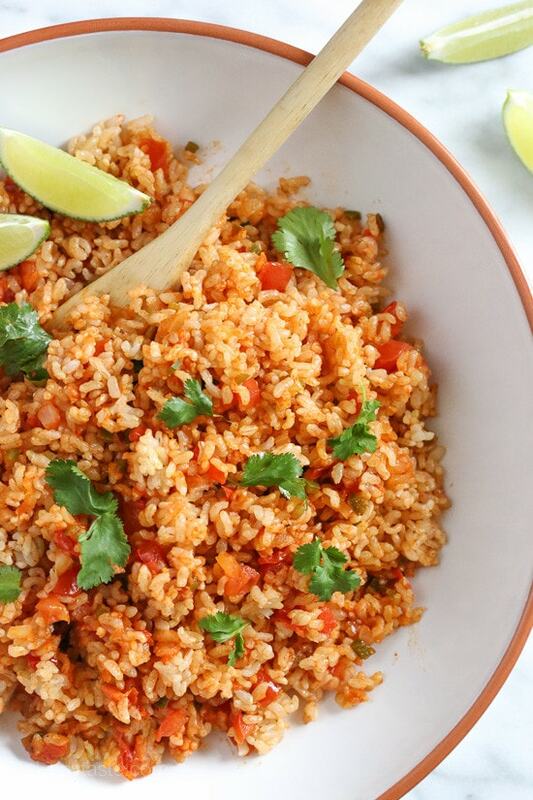 I made this Mexican Rice with your Skinny Chicken Enchiladas for dinner. My husband devored them. The next day, the enchiladas had gotten soggy, so I took the spiced chicken out and mixed it with my Mexican Rice and… tadah !!!! Mexican/Cajun jambalaya. I'm from Louisiana, so we know jambalaya. It was all delicious and skinny healthy. Thanks! I also bought 2 of your cookbooks. One for myself, and one for my Weight Watcher's coach. Trying the Kiss (my Shrimp) and Grits tonight. Yummmm!!! Looks delicious as always! I am so excited to try this out with my fajitas later this week. I know you say brown rice in the recipe, but my pantry is overflowing with white rice. Do you think that would be okay to use instead? 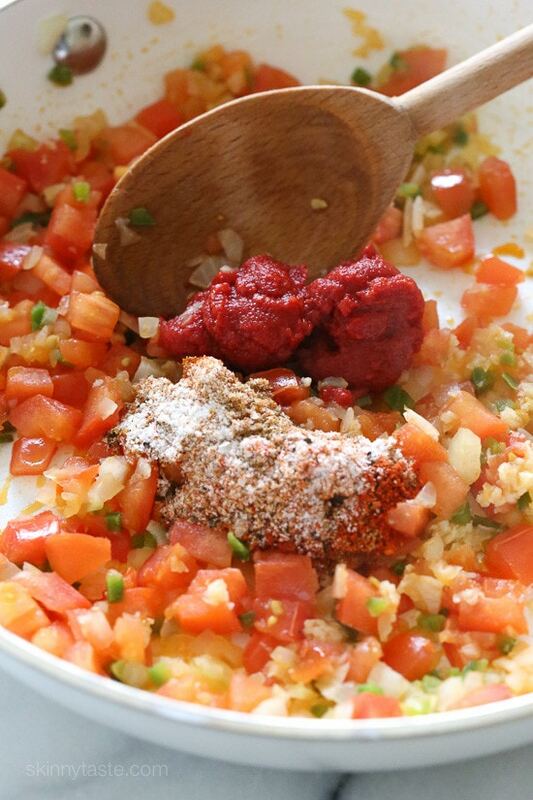 You can save even more time by just stirring salsa into the rice. I guarantee you it is worth the effort here! Fantastic flavor combo! Ok, adding this to my list of SkinnyTaste recipes. I made your Latin Yellow Rice tonight! Oh, I have looked and looked for a healthy Mexican rice! And to find one that uses precooked rice? This will be on the menu soon!! !